Erect, smooth shrub, 1.5 to 3 meters high with a cream-colored sticky resinous juice. Leaves are in whorls of 3 or 4, linear-lanceolate, 10-15 cm long, with numerous horizontal nerves. Flowers are showy, sweet-scented, single or double, 4-5 cm in diameter, white, pink or red, borne in terminal inflorescence (cymes). Fruit is cylindrical, paired, with deep linear striations, 15-20 cm long. Seeds are numerous and compressed, with a tuft of fine, shining, white, silky hairs. – Herpes zoster (skin): Crush leaves, mix with oil and apply on lesions. Do not apply on raw surface. Milky juice of the plant is irritating. Caution: Not to be taken internally. – Herpes simplex: Mix 1 cup of chopped leaves and bark with 2 tablespoons of oil. Apply to lesions 3 times daily. – Ringworm: Chop a foot long branch and mix with 1 cup chopped fresh young leaves. Mix the juice with 5 drops of fresh coconut oil. Apply 3 times daily. – Snake bites: Pound 10 leaves and a piece of branch. Apply poultice to the wound. – Root, locally and internally, used for abortion. – Roots, made into paste with water, used for hemorrhoids. – Roots and bark used externally for eczema, snake bites and as insecticide. – Fresh leaves applied to tumors to hasten suppuration. Glycoside, oleadrin; tannin; volatile oil, 0.25%. 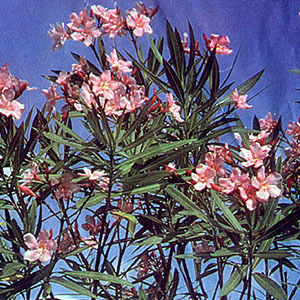 Nerium oleander’s leaves contain two principles: neriin and oleandrin, glucosides with properties similar to digitalin. The seeds contain phytosterin and l-strophnathin. The bark contains toxic glycosides: rosaginin and nerlin, volatile oil, fixed oil. Nerium odorum’s bark yielded two toxic bitter principles­neriodorin and neriodorein. Another toxic principle is karabin. Both karabin and neriodorin are probably resins, rather than glucosides. The pharmacologic actions of of neriin and oleandrin resemble those of digitalis glucosides. In human beings, toxicity manifests as nausea, vomiting, colic, decreased appetite, dizziness, drowsiness, bradycardia and irregular heart beats, pupillary dilation, and sometimes unconsciousness attributed to digitalis poisoning. Cultivated for its flowers; nowwhere established. This entry was posted in List of Medicinal Plants in the Philippines on February 23, 2009 by Pinoy Herbs.